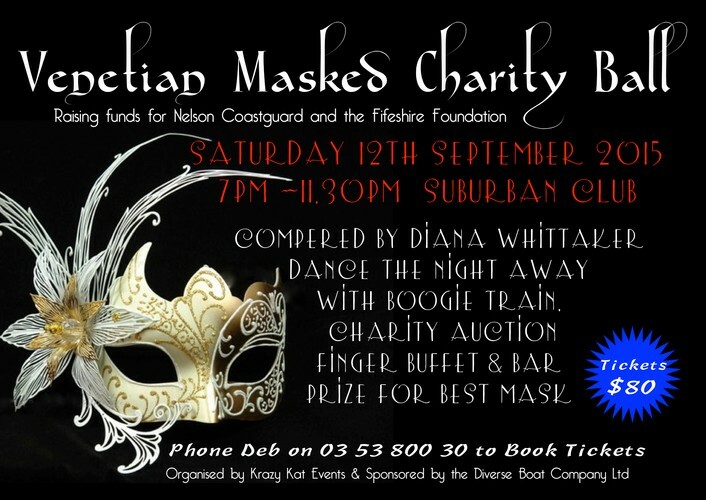 A Venetian Masked Charity Ball to help raise funds for Nelson Coastguard and the Fifeshire Foundation. These two fantastic organisations need our help to continue the amazing work that they do in the Nelson Tasmin Region. We are putting on an amazing Venentian Masked Ball where you can dance the night away with one of Nelson's top bands Boogie train whilst enjoying a finger buffet washed down with drinks from the bar. Not only do we have an awesome band we will be holding an auction of various goodies. These will be auctioned by well known local celebrity Medium and Clairvoyant Diana Whittaker. Vicki Turnbull Photography Nelson will be on hand to capture your wonderful masks for immortality. There will be spot prizes throughout the evening. Dig out those dancing shoes, dress to impress and help us raise funds for two worthwhile local charities Nelson Coast Guard and the Fifeshire Foundation, so they can continue to assist individuals and families at times of need. Tickets must be purchased in advance online from Eventfinda or in person at Richmond Mall customer services information desk. Please note that there will be No Door Sales. Contact Debs on 035 3880 030 at Krazy Kat events for further information.